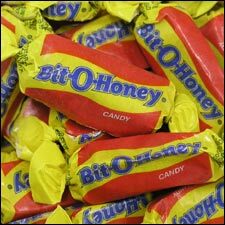 Thanks to the Mast General Store, I have rediscovered the Bit-O-Honey. I haven't had any since I was a kid. My dad used to get them all of the time. At least the way I remember it, it was all of the time. In reality, he probably only picked that candy a few times. Regardless of how often my dad purchased these little delights, they always seemed like an "adult" candy to me. I can't actually remember any exact event that led me to believe this. Maybe it was because the adults wouldn't share their Bit-O-Honey's with me. Or maybe they had a fear that I would choke on it or something (...it is a very chewy candy). Possibly it was a little bit of both; they convinced themselves that I wouldn't be able to handle it's awesome chewiness, so they hoarded them all for themselves! Eventually I was able to get my hands on one. I felt like I was intruding into the land of adulthood with my stolen bit-o-sweetness. All of that put aside, I am lovin' these candies! Unfortunately I can't eat just one. I stick one in my mouth, and it never lasts as long as I really want it to. I chew on it for awhile, enjoying every little squish of juicy honey-nutness, then suddenly it disintegrates. The flavor lingers for awhile, mostly due to the little bits that have attached themselves to my teeth. Once that last little bit has been wrenched loose with my tongue, I give it a quick chew then catch a glimpse of the jar out of the corner of my eye. 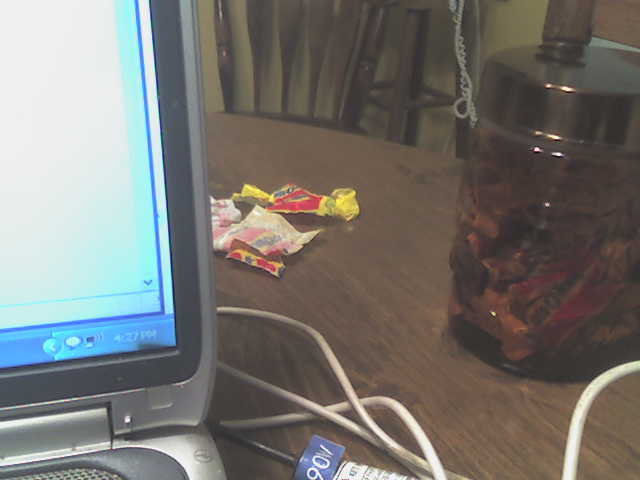 I usually end up having a little pile of wrapper debris before I force myself to stop. I have been asked to teach the counseling class again. I was really hoping that this would happen, because I really enjoyed the last time that I was able to do that. (And, I have to say that it is a good sign, when you are asked to do something again... It means that they must not have hated me the first time I did it.) This time the topic is Progressive Sanctification in Counseling. First I have to say that every time I am given a topic, I seem to be hit with all kinds of things in my life to help remind me of why God has really allowed me to teach this class. I can assure you that God has not allowed me to teach because of my great knowledge on a particular subject, or because of my amazing ability to present a lesson. No, no, that is most definitely not the case. The reality is that God allows me to teach because of my great need to learn and grow myself. Quite humbling, if you ask me. When I was given the Idols of the Heart topic, God began to reveal in me all of these idols! I was full of them! I thought I was doing pretty good on this idolatry thing, but no! Far from it! Well, this topic has been no different. From the time the teacher told me that I was going to be teaching Progressive Sanctification to this exact moment, as I am typing this post, God has shown me over and over again in these last few weeks, that I have not arrived. I am still in great need of Sanctification myself. Second, I also have to tell you that I am the absolute slowest note writer -- ever! I hate to sound childish, but it takes me forever to complete a set of notes. As you can tell, it is Saturday night, and I have to teach tomorrow, and I am still making revisions. Crazy. I find that the most difficult thing is just coming up with a basic outline that makes sense to me. I will spend hours trying to formulate the flow of the lesson: all of the transitions between points, nice illustrations, etc. When I was a school teacher, I just needed the basic material, and I could wing the rest. It always came so naturally. Truth is, I probably over prepare, but hey, these are adults that I am speaking to. It just seems so different! Anyway, I better get back to work. I still need to practice teaching this thing 100 more times before I feel comfortable. The other driver had relayed to my boss that there were just a few items left over, nothing that one person couldn't get by himself. 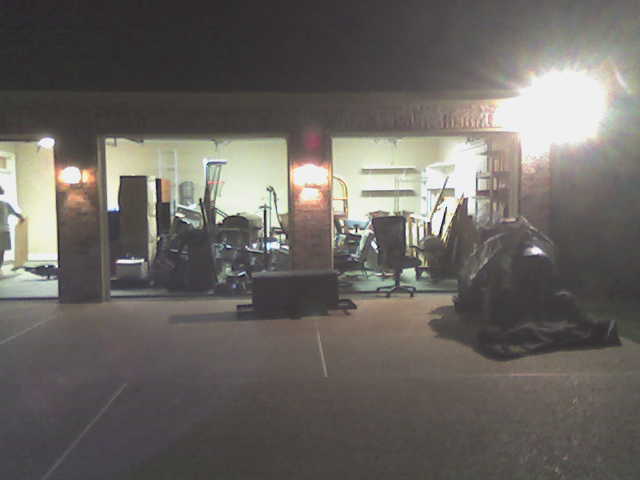 He also said that everything was moved to the garage. Sounded easy. And it would have been easy if this other driver had actually been telling the truth. I didn't arrive at the residence, which was way down near the coast, not too far from New Orleans, until about ten at night. Now remember, I had already unloaded an entire shipment of stuff, then I had spent nearly five hours driving to this location. To be completely honest, I was pretty tired before I had even arrived, but I kept telling myself that it was just a little bit of stuff. Nothing too difficult for a mover like me! I couldn't believe it. Right after I pulled up to the house, the owner came out and said, "Well, I gotta get to bed. Good luck. See you later." Umm, yeah. Sure. I'll get all of this up here. It was about one in the morning. I had been ignoring it the entire time, glancing at it out of the corner of my eye, but ineveitably I had to deal with it. It wasn't a little riding mower, it was one of the big ones -- heavy duty stuff here. I thought that I could push it up the ramp. I have done that before with much smaller mowers. Didn't work. Then I thought that I might be able to pull it up the ramp, so I tied a strap onto it and I was able to get it about half way up, but then I had visions of it rolling back down the ramp and crashing through the back of the garage. I quickly rolled it back down. Then I said to myself, "I am smart guy. I know geometry, calculus, advanced mathematics... I can figure this out." I stood there for about 10 minutes, and right before I dozed off in that standing position, the solution hit me. I want you to know that I am posting this video, knowing that I will be made fun of for this. Please take into consideration that I had been awake since about 5:50 that morning, and it was now about 1:30 the next morning. I tied two straps onto the mower, and as I tightened the straps, it gradually pulled the mower up the ramp. All I can say is that the mower made it up there. After it was in the truck, I quickly strapped it off and drove to the nearest hotel. And don't allow any evil to rule over me." I think that it is amazing that God brings the right passages of scripture into our lives at just the right time. The verses that have been the most applicable to my current situations have been the exact same verses that I have found in my daily Bible readings. The verse quoted above is one of those verses. I decided back in January that I wasn't going to sign on for another year of teaching. This might be news for some of you who only keep up to date through this blog. I did not make this decision lightly. I had surrounded it with prayer and wise and varied counsel. Of course this decision left me facing in the direction of the unknown, (not my favorite direction to face) but I was sure that God was going to open some unforeseen door. Until that happened, I did know that I had a way to provide for my family, which was my primary concern and one of the motives for leaving education to begin with. I knew that I could be a truck driver as long as I needed to be, but I also knew that I wouldn't be doing that permanently, so the path before me seemed so clouded. There have been times in my life when the path set before me seemed bright and cleared. That, of course, never lasted, but it at least seemed that way. But now I was facing a course where I couldn't even see a few feet in front of me. I don't know about you, but when things get like that, I occasionally have a day or two of freak-out. I get this panicked feeling, and I want to get everything fixed as fast as I can. Sometimes that leads to un-thought-out decision making, and with me it almost led to a job that would not have been the right thing at all. Fortunately, God opened my eyes enough to see that before I signed on the dotted line (literally). Shortly after that, I read this verse. Now I know, both by truth that has been taught to me and also by my own personal experience, that I absolutely need to remain fixed in God's Word. But when I read this, it dawned on me that fixing my footsteps in God's word isn't just some metaphorical phrase to be quoted to ourselves when we are feeling directionless. NO, it is the essence of practicality. God's word clearly lays out how we are to live. The Bible is not a big quotation book for positive thinking. It is a living powerful book that has all that we need for life and godliness. And for me to "fix my footsteps" in it means that I will, by faith, do what the Bible says, trusting that God knows what He is talking about. So, that is what I am doing. I am walking down a path, with God's word as a lamp and a light, showing me exactly what the next step is that I need to take. I hope to remain fixed in His word by reading and studying daily, and by praying for His grace to be sufficient. Here is the final week of the teaching. To listen to all four weeks of the teaching visit my odeo podcast. I have added the third week of the Idols of the Heart lesson. Here is a link to my podcast, where you can find the other two lessons and download the mp3's for listening to on your ipod. the sins of others trail behind them. In my life I have fallen into both of these categories. There have been times when my sins were worn on a badge on my chest. They were right there out in the open for anyone to see, anyone who was looking. Sometimes I was the only one who could not see these sins. I was under the impression that I was doing pretty well, when those who were closest to me were being hurt. Other times I have kept my sins hidden. I was the only person who could see these sins. I held onto them the way a man might hold onto the last bottle of water during a drought. These hidden sins were the last remnants of a former self, a self that I clung to, even though it was detrimental to me. A better illustration would probably be more like a man holding onto a bottle of sea water during a drought. Secretly taking drinks of it, thinking that it those cool drinks would be satisfying. But sea water can never satisfy thirst. It only heightens it. I would have been like that man, when there was a cool fresh-water spring within reach. This verse was written as a warning, in the context of elder approval. When one is choosing an elder, great caution must used. There is always the possibility of hidden sins. You may not see them right away, but they will show themselves eventually. Even though this verse was written to assist with the evaluation of others, I read it as a warning to myself. (It seems that most of the verses I read end up having their targets aimed at my heart.) I recognized how I fit into this verse. I don't want my sins to be leading the way in front of me, and I most assuredly don't want my sins to be following up behind me, leaving a trail of destruction. I want to be the kind of person who is laid bare in the eyes of Christ, not withholding anything. I want my sins to be dealt with right now, today. Not in front of me or behind me. Right here. Let's get to the heart of the problem. The Bible is the exact tool that I need (that we need) to achieve this. It is living and powerful. It is the only book that has the ability to cut to the depths of the inner being, and it will reveal the heart (Heb. 4:12). And the heart is the exact place where we need to go. It is the source, the wellspring of all sin (Mk. 7:21-23). May God cleanse our hearts and renew our spirits (Ps. 51)before the trail of sin becomes irreversible.